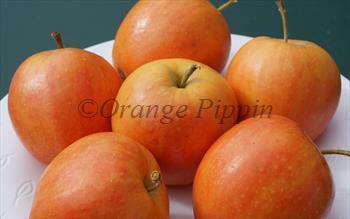 Surprize is a new apple variety with a unique combination of bright orange skin and a surprising pink marbled flesh. 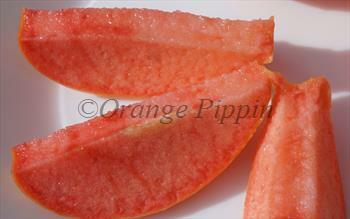 Surprize ripens in early September, and the pink flesh is crisp, with a sweet-sharp flavour. This is also a good variety for juicing. SurprizeTM is a trademarked variety. Please fill in the details below and we will let you know when Surprize apple trees are back in stock. A new red-fleshed apple variety, with attractive crimson blossom, also known as Baya® Marisa. Surprize is in flowering group 3. Surprize is self-sterile and needs to be pollinated by another tree of a different variety nearby. Since it flowers in the middle of the blossom season it can be pollinated by most other apple trees.